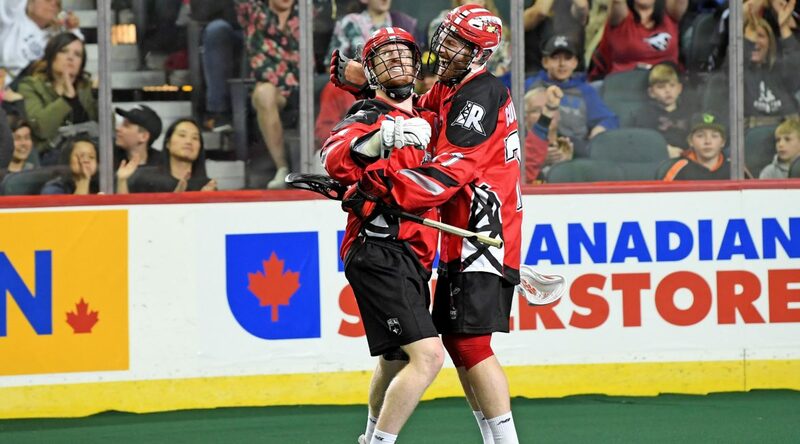 A short-handed goal from Curtis Dickson with just over two-minutes to play was the difference as the Roughnecks stung the Swarm 14-13 at the Scotiabank Saddledome. All 11,826 fans were on the edge of their seats until the very end as the Riggers spent almost all of the last four minutes of the game on the penalty kill. Not the spot you want to be in against the league’s second strongest extra-man unit. “I was talking to Delbs and he was under some pressure at the end, so I told him to wait until he’s standing in the middle of the bench and you have no control of the game,” joked Malawksy. The league’s leading scorer with 107 points, Dane Dobbie, was on fire once again for the Roughnecks as he deposited four goals and four assists in the win. Dickson (4g, 2a) followed with a big night, while Rhys Duch (1g, 3a), Tyler Pace (4a), Riley Loewen (2g, 1a) and newcomer Jesse King (1g, 2a) all made solid contributions. There were fireworks in the first half, with the Riggers reaching double digit goals and the Swarm not far behind with eight. While the Roughnecks spread the ball, the Swarm relied heavily on the stick of former Roughneck Holden Cattoni, who tallied four goals. But things slowed down in the second half, with a much stronger defensive effort from both squads. Heading into the game, Calgary had a clear plan in place to slow Georgia’s potent offensive attack. And although they got burned once or twice, they stuck to the plan and made sure to slow the pace of play. The Roughnecks will be back in action next weekend as they host their division rival, the Saskatchewan Rush (7:00 P.M.) at the Scotiabank Saddledome on Saturday, April 20 during their annual Fan Appreciation Party.